One of the advantages of working for an international company is that you get to travel once in awhile and then sometimes you get lucky and there is a show in town you want to see. Well I got lucky this week. I went to Copenhagen for a meeting and Magnum was playing the same night, there so of course I stayed the night and saw the band play. 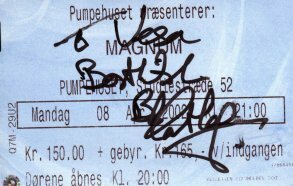 The place where Magnum played is called Pumpehuset and it's a rockclub where they have live music almost every night I guess. I missed Pretty Maids, they played there Saturday evening. OK, to the show. Tyla was playing when we got there but we stayed downstairs and drank beer. When we finally made it upstairs he had just finished. I guess it was just him and guitar, don't know but I need to check how he sounds these days. Time for Bob and Tony plus the guys to hit the stage (Way too many beers in me by now). The sound was a bit blurry and somehow Bob's voice got lost behind guitar and altogether the sound could have been better. The songs that I wanted to hear were "Vigilante" and "Rockin' Chair" and guess what - they played them both. They played some songs that I had never heard, but I don't have a good collection of Magnum music anyway. I know they played at least one song from Wings Of Heaven CD. They also played some new songs but because don't have the cd I don't know the names but heard from Bob that they were going to play a good mixture of old and new. Yes, I got to talk with the little man (Hopefully there'll be an interview with Bob soon too). The thing with shows like this is that if you like this kind of music you enjoy it even without knowing the songs, and that's what happened to me. I had two ladies with me and they had doubts about the show but at the end the both liked it. There was plenty of room at the show but still there were more people than I thought there would be. This is also sad when living in Finland that bands like these don't come here that easily. Denmark is so close to Germany that it's easy to play a show there. The reason why this review is not so detailed is that I really had too many beers - it's hard not to drink when everything is free. A big thank you goes to Henrik Vester who set me up with free tickets. Henrik, you missed a good show. Please do yourself a favor and go see these guys because they have a bunch of great tunes that are great and without the beer they sound great too.